Calla lily toasting glasses. A set of 2 calla lily design toasting glasses. Comes packaged 1 set in a gift box. Each glass measures 10inches high. The shipping weight is 1.5 lbs per set. Beach theme toasting glasses. Beach theme toasting glass set accented with seashell design in sand colours. Comes packaged 1 set in a gift box. Each glass measures 10 high. The shipping weight is 1.5 lbs per set. A burlap glass set is the perfect accessory for your rustic themed wedding. Stems are wrapped in burlap. Lace, satin ribbon, rhinestones and pearls compliment each glass. Glasses are sold in sets of two and measure 8 inches tall. Each base and stem on this pair of toasting glasses is made of aqua-coloured glass, which adds a tiny splash of colour to the wedding reception. Size: 10. 5 inches tall. Also available in black and red. Each base and stem on this pair of toasting glasses is made of black-coloured glass, which adds a tiny splash of colour to the wedding reception. Size: 10. 5 inches tall. Also available in aqua and red. Each base and stem on this pair of toasting glasses is made of red-coloured glass, which adds a tiny splash of colour to the wedding reception. Size: 10. 5 inches tall. Also available in aqua and black. 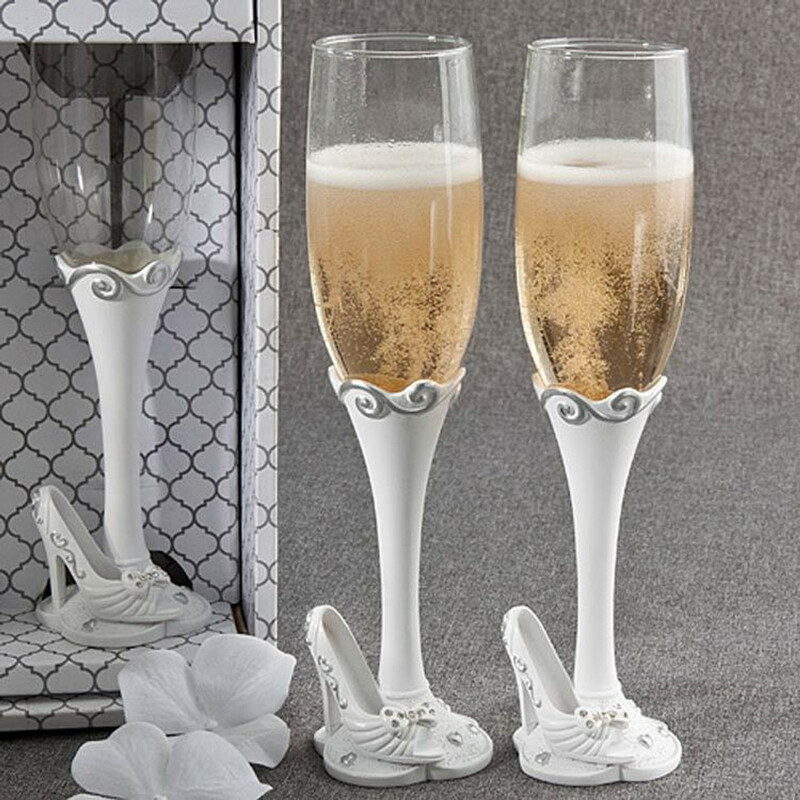 Standing 10 inches tall, this pair of glass toasting flutes adds a touch of elegance to the wedding reception The scroll heart design is metallic silver and shines with the surrounding light.